Testosterone propionate - the most well-known type of esters of testosterone-based anabolic steroids. A bit of history. synthetic hormone testosterone was invented and launched other 30-s of the last century. In 1935 in Germany it was synthesized by the synthetic method of this male hormone. In the same year, German biochemists were able to describe the structure of testosterone and began to conduct experiments and experiments on its association with other substances. Scientific research in the field of biology, Physiology, and biochemistry of the testosterone found the paper. 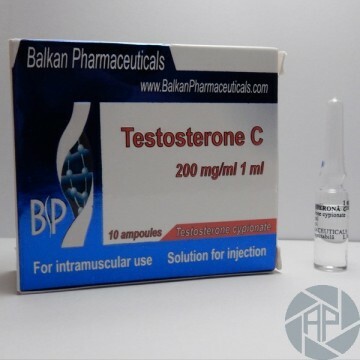 Since the second half of the 20th-century testosterone, both in pure form and began to be used in combination in the sport with other substances, including bodybuilding. The athletes pointed out that the drug can be used as the course of drying and to recruit muscle. This is facilitated by its properties, including the burning of body fat, increase muscle mass, the improvement of the characteristics of resistance and force increased libido. The most common side effects of the bodybuilder's words are acne, Gynecomastia, hair loss, prostate enlargement. As a general rule, such side effects occur as a result of a significant drug overdose. The analysis of the responses of athletes of all categories can be concluded that the drug has good anabolic properties, can significantly increase the muscle mass of the athlete, leads to its quality. It also restores a muscular athlete. This takes place through satellite cell proliferation in muscle tissue, in consequence of which it is not hyperplasia, which leads to the normalization and the restoration of the muscles of athletes.